Spins in place and generates yellow dust particles. Fel-Touched Pet Supplies is rewarded upon defeating a legendary "boss pet" in Tanaan Jungle. There are a total of 15 boss pets to battle, each rewarding a single bag. There are no quests to pick up or turn in. Simply defeating a boss pet in Tanaan Jungle will yield a bag. Players can battle each pet only once per day per character, resulting in a maximum of 15 reward bags for each character in one lock-out. The Seaborne Spore is one of four possible pet drops from Fel-Touched Pet Supplies. A creeping fungus infects the target, causing 137 Undead damage each round for 4 rounds. Deals additional damage in Moonlight. Deals 6% of the target's max health as damage every round. Reduces up to 78.8 damage from each attack against you and deals 59 Dragonkin damage each time you take direct damage. Throws blinding powder into the target's eyes, reducing their hit chance by 100% for 1 round. Places a mushroom near the enemy team. It grows for 2 rounds, then unleashes a cloud of spores. The spore cloud infects the front pet, dealing 197 Elemental damage every round for 3 rounds. I've been doing the daily battles for baggies and watching the AH for this Spore for ages. Still hasn't dropped from a bag, but I just snagged a level 25 off the AH for only 14k. Consideirng level 1's go for +30k usually, I'm doing an epic happy-dance right now. Got one today for 40k off the AH. I did see another for sales 7-10 days ago but missed it - for similar amount (though I think it may be the same seller, so it may just have been relisted after a failed sale). I can't say if there's currently a bug with fel-touched bags concerning the non-drop of this pet. All I can do is urge people to keep trying. Two weeks ago, though I don't recall which day of the week, three Seaborn Spores dropped on the same day as I made my way around Tanaan Jungle doing the pet battles. Of course since then, I've seen not a one. I was lucky enough to get one in the AH on 29/7/15 for 3k. I asked the seller about it and he said it dropped for him that day. Not sure where this *bug* was mentioned or who mentioned it, however it took exactly one week for me to get all 4 pets, Seaborne Spore to be the last in the collection, not the first few hours of the patch. As a matter of fact, patch day was on a Tuesday, I didn't get a Nightmare Bell (my first pet) until Friday or Saturday, the Seaborne Spore on the following Tuesday. I want to add to the people saying they havent gotten theirs. Ive opened roughly 200 bags (give or take one or 2) and ive gotten 3 nightmare bells, 3 zangar spores, and 4 periwinkle calves. but obviously no sign of this guy. I went to look on the AH and the are rare there as well and when they are there go for like 30k ish. And thats is on an High Pop server. when i look on my lower pop servers there are none to be found. Yeah these are not dropping the way they should, got all the other pets and not one of these. There are a few on our AH for like 64k. They must of got them before the bug and taking advantage. Will wait my self. Just to add to the first two comments, I've done as much 'hunting' on the AH as in the Jungle due to time issues as much as the reluctance to be killed repeatedly by Felguards - I've not seen a single Seaborne Spore offered, and I've managed most of the rest of the new pets by now. So far only a handful of people got lucky in the first few hours of the patch and got it. However, it seems nobody can loot it since then. One of the many bugg that's still unatended for. I've decided to stop doing the fel touched pet until they fixed it since i got the three other ones. I have had real problems geting this pet from a fel-touched bag. I have 10 alts on Mally and have farmed these boss pets on most of them every day for the past week and a half. So far I have looted 4 Zanger Spores, 2 Periwinkle Calfs and 1 Nightmare Bell. I've talked to other pet collectors and they too have had no luck on looting the Seaborne Spore. Is there a bug with the Fel-Touched Bag's? Anyone else know of issues? 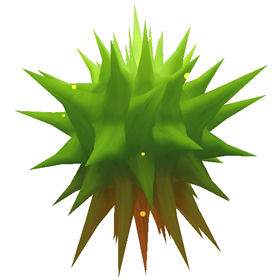 A spore from Zangarra, a central area of the Zangar encroachment that would later bloom into the Zangarmarsh.